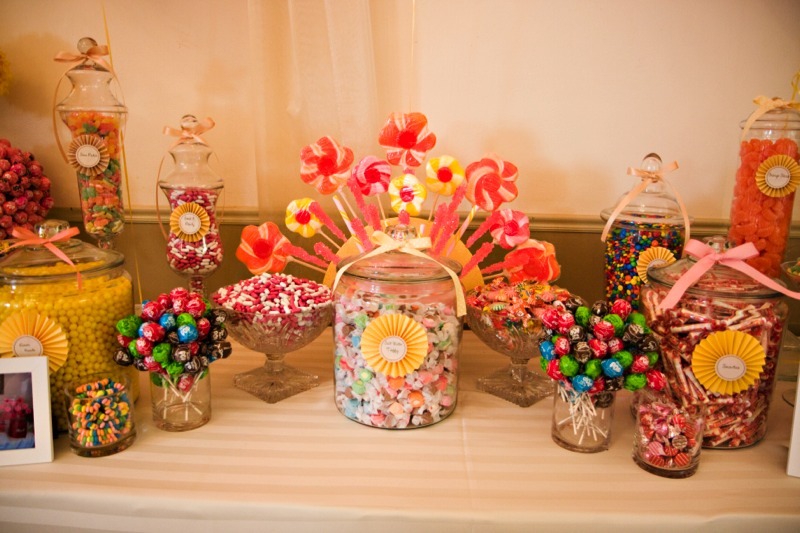 Candy Bar Tips for your wedding reception from The Canterbury Place. Here is a good idea for a wedding reception. Thanks to Ashley from The Canterbury Place for putting this together. At The Canterbury Place, our favorite favor is the candy bar. Not only it is delicious, but it is also an interactive part of your reception that everyone will love and remember. 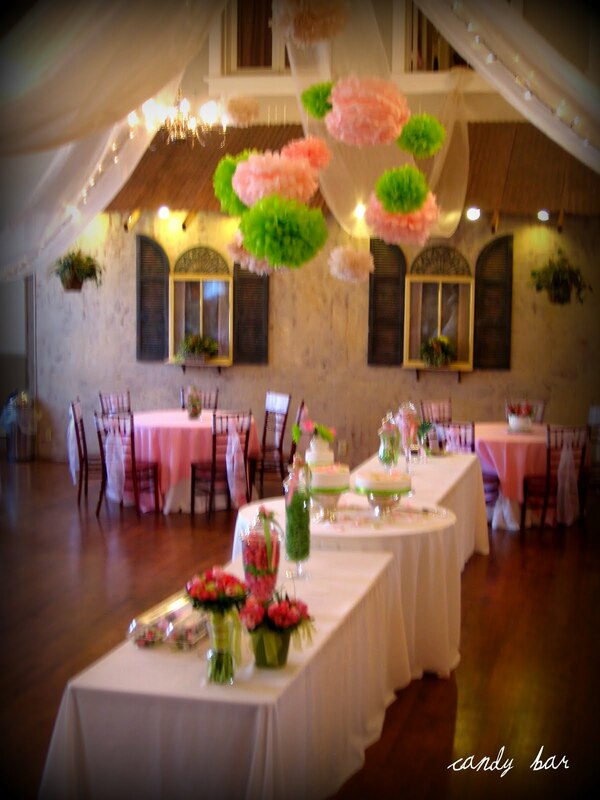 Below are tips on having a beautiful set-up that is sure to make your guests feel like a kid in a candy store! Match your candy to your wedding colors to keep a cohesive look. This edited palette will help pull in the look and feel of your wedding. Shades of purple were obviously the colors of this bride’s wedding- she picked candy only in those colors and coordinated the color of her table linen (a gorgeous plum crushed table topper) to bring together her elegant reception. Keep your candy bar interesting by having a variety of shapes and textures. This bride opted for lolly pops, gum balls, taffy, candy sticks, M&M’s, cinnamon bears, and sugared grapefruit. Although she kept all the colors of candy in the pinks and reds, the variation in shapes and sizes creates a beautiful presentation. We suggest purchasing between 5-10 different types of candy to achieve this look. Another trick? Layer different colors of the same candy to create a striped effect in your jars. Just like belts and earrings help make the perfect outfit, ribbon, and labels make the perfect candy bar. Add coordinating ribbon to the tops of your jars and the handles of your scoops. This is a great place to bring in pattern with polka dot ribbon like above. To create a more customized look to your table, add labels to each jar. 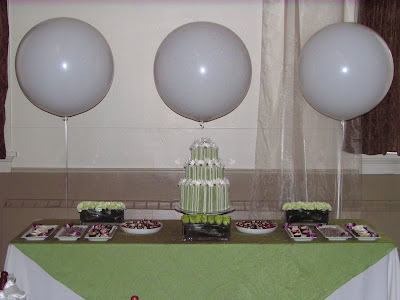 This is another great way to bring in the feel of your event and easy to design. The labels above were printed on labels purchased from a craft store and applied to hand made pin wheels. Another tip? Create a sticker to use to close the candy bag. Monograms as well as a quick “thank you” both work well. At The Canterbury Place we have a good selection of containers. Our favorites are Apothecary jars in a variety of heights. Mixing in smaller containers and trays works nicely too. We also suggest being inspired by your centerpieces- square vase on your tables? 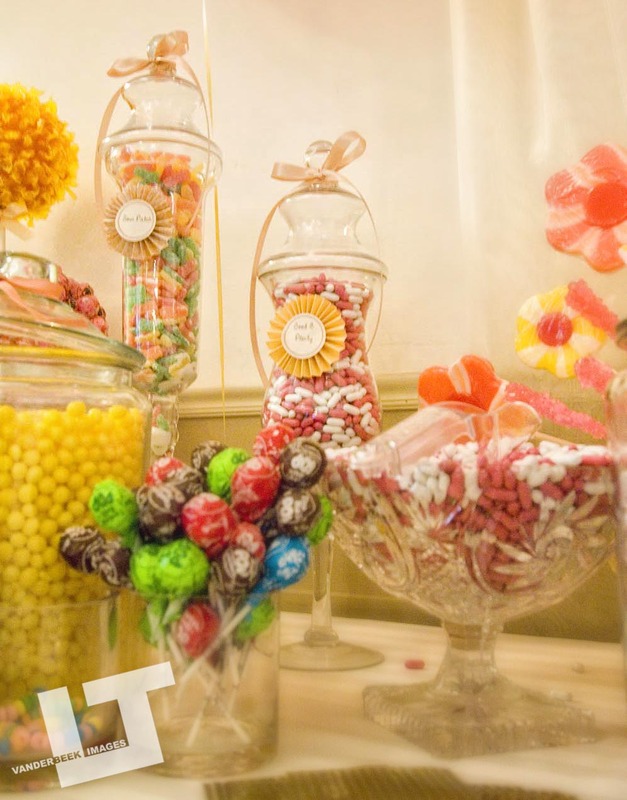 Incorporate square vases onto your candy bar table too. The bride above mixed her candy in with her desserts for more of a sweets table. It was a great idea and a perfect choice if you are on a budget with your candy as you can buy less when it is displayed this way. 5. Don’t forget the Details! Bags and scoops are 100% necessary for a functioning candy bar. Don’t forget something to keep the bags closed- twist ties or stickers work nicely for this. Wondering on tips for purchasing amounts and where to get unique candy? Ask our wedding planner Elysha. For pricing on our candy bars, contact The Canterbury Place.